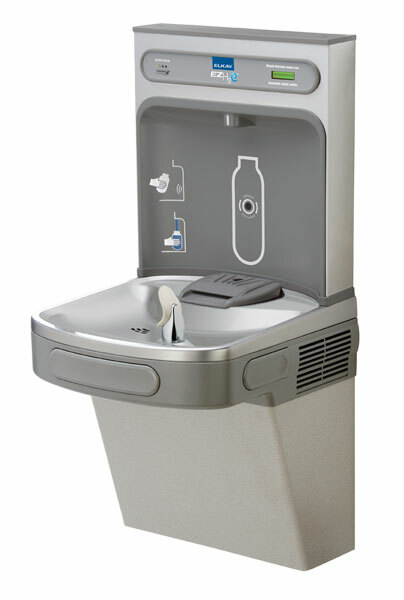 The ezH2O™ Bottle Filling and Water Cooler unit by Elkay (Manufacturer # LZS8WSLK) is an ideal unit for many indoor situations including schools, campuses, hospitals, airports, office buildings, and many other public facilities. This wall mounted sensor operated bottle filling station and water cooler is a dual purpose drinking station that provides users with a refreshing drink from the push button water cooler, and through the sensor operated bottle filler. This unit is vandal resistant and ADA compliant, and is available in variety of different chilling capacities including non refrigerated, and voltage/amp combinations. These units promote sustainability and reduce plastic waste through encouraging the use of reusable bottles. *New features of ezH2O units by Elkay: ezH2O units are even more energy saving with an energy saving scheduler which allows you to turn off the refrigeration function of the unit during times of low/non use. The filter status of the units now automatically resets when the filter is changed. These units now self review themselves to aid in troubleshooting unit problems, making maintenance of the unit easier. ezH2O units now have a low energy LED screen which illuminates hallways, and aids in filling dark bottles. - Filter Monitor indicating when replacement is necessary. - Green Ticker counting the quantity of 16oz. bottles saved from the landfill for non-refrigerated units and 12 oz. bottles for refrigerated units. Discover which model is best for your situation by giving one of our product specialists a call at 800-442-6622, or submitting an online quote request. 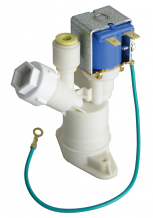 Equiparts has been providing maintenance and plumbing solutions to businesses since 1968. We are a team of reliable, educated product specialists with unparalleled knowledge and technical expertise. • Experts, Not Order Takers - Our team receives ongoing training from our manufacturers in order to stay up-to-date with new products, product revisions, and industry standards. • Large Inventory - Unlike some of our competitors, we have thousands of parts in stock ready to ship. Our comprehensive line of repair parts and ready-to-ship positioning make us a strong source for businesses that need parts both quickly and affordably. • Strong Manufacturer Relationships - We have master agreements with many major manufacturers. Our strong relationships with them enable us to provide the best OEM products and pricing to serve our customers’ needs. • Network - Equiparts is part of an industry specific nationwide network that gives us support for very large orders.